My high school classmates and I are currently having a good time spamming each other's inboxes. 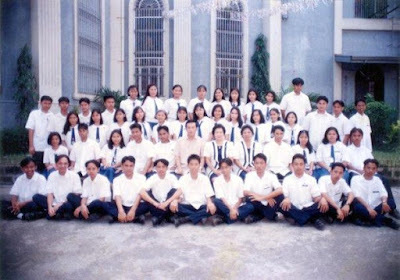 A former classmate posted our old 4th Year High School class photo in his Facebook album and tagged everyone. As of today, total comments are at 370 and counting. It's nice to reconnect with people you have grown and matured with. I can say I really had a good time during high school. 'Twas the time when I was fully able to let my hair down and forget about the stress of having to maintain my grades for honors. I was Valedictorian in grade school and I ended up only having a Loyalty Award come graduation time in high school. Heck, I had the best time of my life! Never mind the grades, at least, I had true friends. The reason why we never had a prom was because the school administrators had to teach us a "lesson". Our whole class had an impromptu after-retreat party in our class president's home. It was a spur-of-the moment decision in my part. My co-officers in the Student Government were part of it so I went straight to the nearest pay phone and called my mom to ask permission. My mom was cool about it as long as I had the money to bring myself to Parañaque. We had no class the following day because it was designated as our rest day. We were unaware that a classmate did not ask permission and it was her mom who called up the school authorities. The following school day was chaos. The class officers and student body officers were sent to the Principal's office and we were asked to give a explanation. They say that we can't have a prom because they cannot trust us anymore. I just laugh about it now that I remember it. Not having to experience a prom night wasn't really a big issue for me. For one, you wouldn't catch me wearing a cocktail dress! Secondly, it spared us from the expenses. But the incident, apparently, did not allow closure to happen at least for some of us. We are scheduling a mini get together and some are suggesting of having a prom night! Oh please! I don't want to browse sites of the best diet supplements in the market today just to make me quickly lose weight for that. I find it amusing, though. I guess how we celebrate the event will not matter to me at all. I am just excited to catch up with everyone!